As the Earth Federation Forces concentrate their manufacturing efforts on the production of their new mass-produced RGM-79 GM units during the latter months of the One Year War, those mobile suits already fielded have to make do with what few materials are available. Since the RX-79[G] Gundam Ground Types are themselves built using spare parts, there are no more spare parts left to effect repairs to heavily damaged units, and field engineers have to literally rebuild mobile suits with whatever they can find. When Shiro Amada's RX-79[G] is trashed in an attempt to stop Zeon's prototype Apsalus II mobile armor in November UC 0079, the Kojima Battalion's engineers and mechanics rebuild his mobile suit with many improvised modifications. The RX-79[G]Ez-8 Gundam Ez8 (short for "extra zero-eight") retains the same beam sabers in the legs, as well as the standard RX-79[G] hand armaments. However, its other fixed weapons are changed out, with a pair of 35mm machine guns mounted in the head and a turret-mounted 12.7mm anti-personnel machine gun in the chest. The Ez8's armor plating and placement is improved overall, and the traditional Gundam "V-fin" on the head is replaced with a sturdier communications antenna. 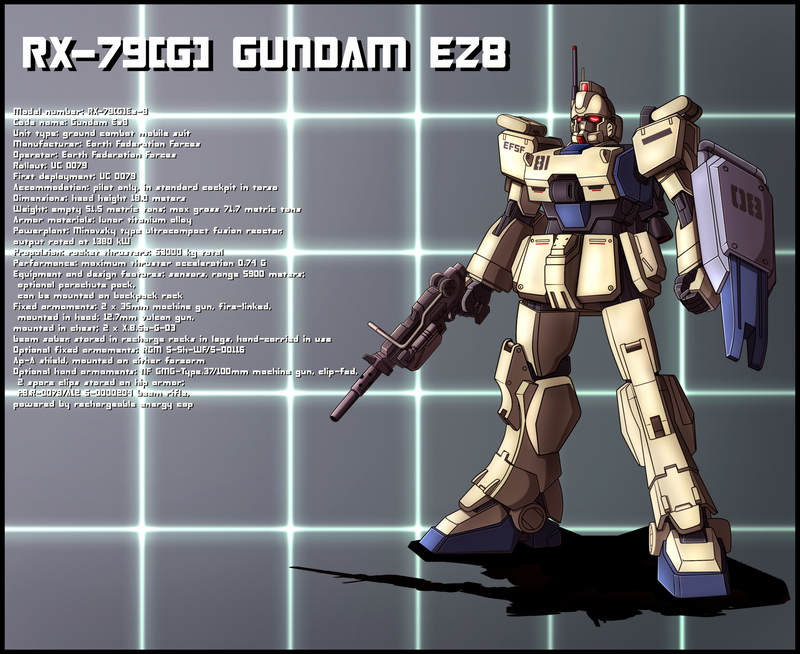 The Ez8 retains the backpack equipment rack from the standard RX-79[G], allowing it to keep its ability to mount parachute packs or other field equipment options. In December, the Ez8 is heavily damaged during an attack on a secret Zeon base housing the development of the advanced Apsalus III mobile armor.